One question I’m always asked if whether you can tile onto timber floors. Well the simple answer is yes, provided they are capable of carrying the additional loads and are sufficiently rigid and stable. If you don’t feel the that floor is strong enough, you can always fit extra noggins between the joists, or overboard with exterior grade or marine grade plywood (minimum 15mm thick), screwed down at 300mm centres ensuring screw heads are flush with the surface. Remember to seal the reserve side and edges with neat BAL Bond SBR before tiling as this reduces water permeability. If you’re tiling direct onto a stable tongue and groove floorboard, then prime the surface with two neat coat BAL Prime APD in the same way, before using a highly flexible tile adhesive such as BAL Single Part Fastflex – ideally at 3-4mm. Alternatively you could try installing an uncoupling system like BAL Rapid-Mat using BAL Rapidset Flexible Fibre tile adhesive. Note BAL Single Part Fastflex is NOT recommended to be used with BAL Rapid-Mat. 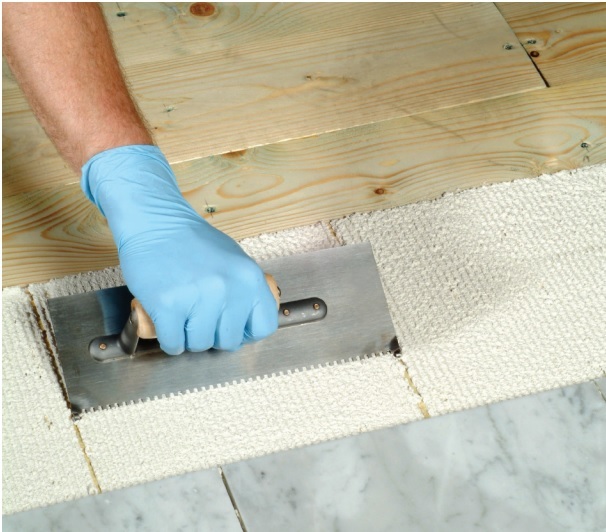 Cutting-edge, BAL Rapid-Mat is less than 1mm thick and works as a buffer layer to protect against the different rates of lateral movement in the timber and tiles surface which can cause tiles to crack or de-bond. When grouting tiles laid over timber you should make the same considerations when choosing your grout as you do when choosing your adhesive. That is to say, consider the need for flexibility to cope with the additional movement faced when tiling onto timber. At BAL we would recommend a product like BAL Superflex Wide Joint or BAL Micromax2, which has extra flexibility that can compensate for the lateral movement. Alternatively consider BAL Wide Joint Grout with BAL Admix GT1 pre-diluted 1:1 with water, or BAL Micromax2 with BAL Admix GT1 pre-diluted 1:2 by volume with water when used with BAL Single Part Fastflex.